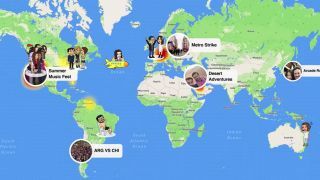 If special lenses and geotags weren't enough, Snapchat is adding a new way to see what your friends are up to across the globe. Snapchat's new Snap Map (not to be confused with the DOOM level editor by the same name) allows users to zoom out to their neighborhood, city, country, and even continent to see where their other Snapchat friends are located. From there, Snap Map also shows heatmaps indicating popular events happening in your area, should there be a concert going on or a major demonstration happening downtown. As competitors like Facebook continue to encroach on Snapchat's suite of features, the app has been looking for newer and bolder ways to stand out. While Snap Map is certainly a unique way to keep up with your peers and their goings-on, only time will tell if the feature will actually catch or flop like that time it tried to to sell selfie lenses for real money.